Science in the Square is an annual event which allows scientists to share their knowledge, passion and expertise with the local community. Last year’s inaugural Science in the Square happened while I was out of town, so my only knowledge of the event came from the enthusiastic reports delivered by the faculty and volunteers who participated. Luckily, the timing worked out better this year, so I was able to head down to Events Square and check out the outreach extravaganza. My arrival happened to coincide with the beginning of the “Love Your Trees” talk presented by Dr. Britt Koskella. She used glitter to “infect” children with various diseases and show them how pathogens can spread from one tree to another. Although her entire talk was interesting and educational, I was particularly impressed by how she related the information to real life, explaining how everyone—scientist or not—can keep an eye on tree health and report infected trees to the proper authorities. Dr. Koskella also encouraged all the tree-lovers in her audience to consider a future in science so that they could take an even more hands-on approach to tending and preserving plants. University scientists at the Cornwall campus Science in the Square event. Other talks included Dr. Celine Frere’s “Love Your Oceans,” Dr. Stephan Harrison’s “Love Your Climate,” and Dr. Dave Hodgson’s “Love Your Wildlife.” Audiences for each of the lectures were sizeable, and yet only accounted for a fraction of all the many people at the event; the tent was thronging throughout the afternoon. 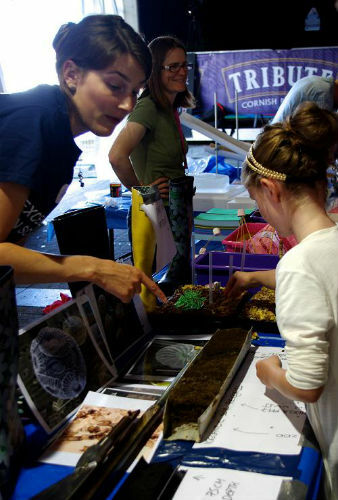 Of course, children aren’t generally inclined to sit down and listen to lectures for four hours straight, so Science in the Square also involved many hands-on activities providing information about both bioscience and geography topics. There were several microscopes providing views of soil, rocks, and microorganisms, as well as a crafty area where kids could make animal masks and get their faces painted. Elsewhere, they could pick up and examine the skulls and pelts of a variety of wildlife, and even see some living specimens in tanks and terraria. Although some of the featured fauna were exotics, there were also several animals—including burying beetles, bees, and many marine species—from right here in Cornwall. One particularly popular station featured an array of real bird wings; kids were asked to determine which wings were associated with different types of locomotion—hovering, diving, long-distance migration, and so on. Rather than be grossed out by the idea of picking up a dead animal’s body part, the children seemed quite excited to feel the softness of the feathers and to see the morphology up close. While all the activities were designed to be fun and memorable, they were also intended to provide useful and applicable information. At many of the stations, visitors had the opportunity to learn about the scientific method and employ real scientific techniques—such as taking soil and water samples. They also learned practical skills, such as how to start a garden by growing plants from seedlings. Several of the stations, such as those focusing on glaciers and climate change, had an underlying conservation message. Although I’d been aware of the lengthy preparations for Science in the Square, I was still surprised by the scale of the event. The huge variety of topics and activities was impressive, as was the professionalism of everyone involved; you could be forgiven for thinking that the afternoon had been orchestrated by outreach professionals or museum staff rather than academic researchers and an army of student volunteers. Hopefully all the attendees were as impressed as I was. More importantly, though, I hope they were bitten by the science bug and took away a new (or renewed) interest in the natural world. For more information see the Science in the Square site. This entry was posted in community, events on 27th Aug, 2013 by Lara Faith Cronin.